Whether coping with a manmade or natural disaster, business disruptions do happen. A fire, loss of premises, wind damage, cyber-attack or data breach, loss of key employees, and even supply chain interruptions can make it difficult for small businesses and nonprofits to keep the doors open. We all believe it will never happen to us… until it does! The Delaware Small Business Development Center and the Insurance Institute for Business & Home Safety (IBHS) are pleased to offer a Free Workbook to help you create a plan to recover from business interruptions. Create an easy-to-use, personalized recovery plan in case the worst occurs. 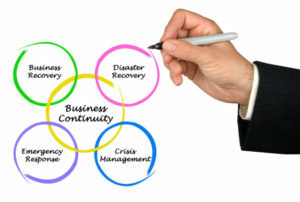 Did you know that one in four businesses is forced to close indefinitely because of a disaster? Small businesses, which are the backbone of the U.S. economy, are particularly at risk along with nonprofit organizations. IBHS’s goal is for every small business to prepare a plan that will enable them to withstand and recover from any type of disruption. The Delaware Small Business Development Center has engaged with partners across Delaware to develop a robust cyber security program for small businesses. The program is called DatAssured™. Learn more about the program here. Check out our videos and webinars on the right-hand side of this page to find out how you can improve the resiliency of your small business or nonprofit organization. 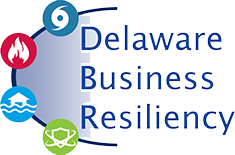 The Delaware Business Resiliency Initiative includes training and informational workshops, webinars, a readiness workbook and one-on-one counseling for small businesses in Delaware as part of its mission to educate on preparedness and business continuity. Delaware businesses need to plan for natural (hurricanes, flood, fire, drought, snow) and man-made (cybersecurity breaches, construction that displaces traffic, power outages) disasters to keep their businesses afloat when these disruptions happen. The Delaware Resiliency Program was created in the aftermath of Hurricane Sandy through a supplemental grant from the Small Business Administration. The grant allowed the SBDC to develop an evergreen outreach and education program that has become an integral part of SBDC services. The Delaware Resiliency Program is guided by a statewide Advisory Board comprised of emergency management professionals, academics and educators, small business and tourism professionals, utility companies, IT companies and others. The SBDC, a unit of the University of Delaware’s Office of Economic Innovation & Partnerships, provides business advisory services for free in all three counties in Delaware through funding from the SBA, Delaware Economic Development Office, the University of Delaware and private sector organizations.